A fine muddle all around. Ottawa would return to the NHL in 1932-33 before relocating to St. Louis for a year and then disbanding in 1935. Over the following four and a half years, there was intermittent talk of reviving the Pittsburgh/Philadelphia franchise – in Pittsburgh. The Quakers and the one-year stay in Philadelphia were almost thought of as an aberration. As it turned out, the franchise would die an agonizingly slow death. The NHL endured Pittsburgh arena promises made and not kept before finally pulling the plug. That the league did not kill off the franchise earlier clearly showed its desire to stand by Pittsburgh and hope for better days ahead in a city that had proven that it loved hockey. At the NHL semi-annual meeting in New York on May 11, 1932, James Callahan was confirmed as Pittsburgh’s governor. (Benny Leonard, now in his mid-30s, had very quietly left hockey and very publicly returned to the boxing ring in August 1931 to recover money he lost in the stock market and hockey. His ring comeback would not be successful.) The Pittsburgh and Ottawa clubs were given until July 2 to decide whether to organize their teams and reenter the NHL or sell their franchises. On August 22, it was reported that Pittsburgh and Ottawa would return to the NHL in 1932-33. The Pittsburgh news caught several NHL governors by surprise. The Pittsburgh Yellow Jackets of the International Hockey League (IHL) also figured heavily in what theToronto Globe called a “fine muddle all around.” The Jackets were having financial problems, despite the support Pittsburgh fans gave them. Some doubted that the Jackets would operate in 1932-33. And the NHL Pittsburgh club’s owners still held territorial rights and could deny the Jackets permission to operate. In turn, the trust company that owned the Jackets had the right to deny the NHL team the right to play at Duquesne Garden. On September 28, 1932, controversy over the lease of a rink for the Pittsburgh franchise was said to have ended. It was reported that Callahan and Dwyer had negotiated a five-year Duquesne Garden lease that would be signed the next day. (The Post-Gazette now openly called Dwyer the Pirates’ “principal owner.”) The Garden would be enlarged to seat 7,000 fans. Day and night shifts would likely be used to meet a seemingly impossible deadline – completing the work on the Garden by the opening of the season in November. Ed Powers, who led the Boston Tigers of the CAHL, would manage the new Pirates. John Ross Roach, Dutch Gainor, and Vic Desjardines of the New York Rangers would likely wear the black and yellow Pittsburgh colors. The optimism was very short-lived. On September 30, opposition to Pittsburgh’s reentry was said to be mounting. Callahan reaffirmed his intention to operate the team. On October 1, Pittsburgh’s NHL hockey club suspended operations for 1932-33. Baseball commanded the headlines in Pittsburgh’s newspapers. Babe Ruth had hit his legendary, much-debated “called shot” in the 1932 World Series the same day. Pittsburgh’s press mentioned the hockey news as a side item. An AP report said the team’s application for readmission to the NHL was denied. Toronto papers said the NHL governors had requested that the team not play. The rink deal fell through when it was decided that the arena would not be ready until sometime after the start of the regular season. The Board of Governors said there was not sufficient financial backing for the arena, and it was understood that they doubted Pittsburgh would support the team. The Governors also told Callahan that Pittsburgh did not have enough time to put a good team together. In addition, they reminded Callahan that the Duquesne Garden was not an adequate NHL arena. The reminder did not fall on deaf ears. Whenever Callahan approached the Governors over the next three years, his proposals would include plans for a new Pittsburgh arena, rather than a remodeled Duquesne Garden.Approval was granted for the NHL to take over Pittsburgh’s players for a $10,000 rental. It was said the players would be returned to Pittsburgh at the end of the 1932-33 season. During the suspension, the Pittsburgh club was entitled to representation on the NHL Board of Governors. But Pittsburgh hockey fans would have to do without an NHL team in 1932-33. The financially challenged IHL Yellow Jackets would also spend 1932-33 on the sidelines. James Callahan was confirmed as Pittsburgh’s governor at the NHL meeting of May 13, 1933. A lack of funds to build a new arena was said to be holding up Pittsburgh officials. No action was taken on the question of the operation of the franchise. Callahan told the press that this money shortage would prevent the operation of the franchise in 1933-34. When the NHL met again on September 30, Pittsburgh was granted permission to suspend operations for another yet year on the understanding that a new hockey arena would be available for 1935. Pittsburgh was also required to tender contracts to its players by October 15 or the players would be declared free agents. The Pittsburgh-Philadelphia franchise traded goalie Wilf Cude to the Montreal Canadiens on October 19 for cash. As best as can be determined, then, contracts were tendered. On October 2, 1933, Callahan optimistically assured Pittsburgh’s hockey fans that NHL hockey would return to the city in 1934-35. He told the Pittsburgh Post-Gazette that Pittsburgh’s Motor Square Garden would be torn down, and a modern 15,000-seat sports arena would take its place on that spot. The Motor Square Garden, located in the East Liberty section of Pittsburgh’s East End, had been used primarily for boxing. On May 12, 1934, Callahan pushed the franchise’s return date back a year when he reported that the Pittsburgh club expected to resume operations in 1935. But a month later, the upcoming season of 1934-35 appeared to be back in the running. On June 11, construction of a new arena was reported to be getting off the ground. The arena, unlike the Duquesne Garden, would be centrally located. Three days later, Callahan said a new rink would be started in Pittsburgh the following week, and that the $2 million arena would be ready in the early fall. The proposed site, again, was the one occupied by Motor Square Garden. That same day, the NHL Board of Governors agreed to extend a franchise to Pittsburgh for 1934-35. The arena project went sour on August 13, 1934. After a meeting between Bill Dwyer and Mellon interests that had planned to build the rink, it was announced that the arena could not be constructed in time for the 1934-35 season. Callahan acknowledged that delays had sidetracked construction, but said, “We are proceeding with our plans, however, to operate our franchise in the fall of 1935.” On September 22, Callahan requested permission for Pittsburgh to suspend operations for yet another year pending further developments in the building of Pittsburgh’s new hockey arena. The NHL granted the suspension, but did so provided that the club would have no official representation on the NHL Board of Governors in the meantime. Callahan optimistically restated that he expected Pittsburgh to return to the NHL before another season had gone by. But the new year of 1935 did not produce positive news. Town Hall’s formal demise in January put the final nail in the coffin of an option that realistically had been taken off the table several years earlier. There was no movement on the Motor Square Garden arena, even with the return of IHL hockey to Pittsburgh after a three-year absence with the birth of the Shamrocks. The NHL meeting of September 28, 1935 didn’t take the Pittsburgh matter very far. The issue was left in abeyance pending Bill Dwyer’s attendance at the governors’ meeting and more facts coming to the surface. Dwyer was trying to sell his New York Americans at this time. The Pittsburgh Press ignored this meeting and focused its attention on the Shamrocks (and the team’s coach, Sprague Cleghorn). The NHL would only cut its weaker franchises so much slack. At the same September 28 meeting, the St. Louis Eagles (formerly the Ottawa Senators) requested a one-year suspension following their unsuccessful 1934-35 season. The Eagles proposed to loan their players to other teams. Those squads would then take over the players’ contracts. Instead, the Board of Governors gave the Eagles two choices: (1) sell the players to the NHL or (2) play again in St. Louis – not Ottawa. The second option was not agreeable to the Eagles. As for the first, the league and the team were too far apart on a price for the players. The Eagles wanted three times what the NHL was willing to offer. On October 15, the Governors terminated the franchise. The team’s players were distributed in a dispersal draft. The NHL was now down to eight active teams and the Pittsburgh franchise, which hadn’t put a team on the ice in over four years and showed no sign of producing a new arena or fans to fill its seats. Callahan and Dwyer had to wonder whether the Pittsburgh franchise was headed for the same fate that the Eagles had suffered. Or whether it would still be around had Bill Dwyer been at the September 28 meeting and the Pittsburgh issue had not been tabled. 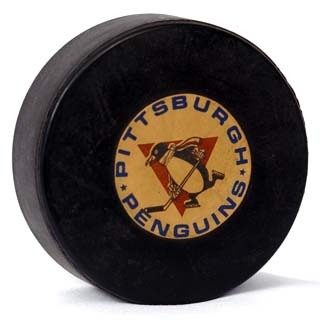 Finally, on May 7, 1936, the Pittsburgh franchise was formally cancelled at the NHL’s post-season meeting in Detroit. The Pittsburgh Press did not bother to report it. In fact, while other meeting items ran in the papers, the Pittsburgh news did not appear in available press accounts. Yet another report of a possible Cleveland arena and NHL franchise surfaced at the meeting. Once again it went nowhere. When the Montreal Maroons departed in 1938 and the New York Americans skated for the last time in 1942, the NHL would find itself with just six teams (the “original six,” though these six teams and four others had actually entered the NHL in stages between 1917 and 1926). The league did not expand from that six until 1967, when the Pittsburgh Penguins would join five other teams to double the NHL’s size.